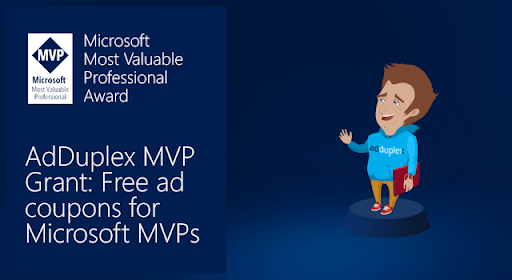 Microsoft Most Valuable Professional (MVP) is Microsoft award given to “exceptional, independent community leaders who share their passion, technical expertise and real-world knowledge of Microsoft products with others”. In short, MVPs give a lot to community. Thus, AdDuplex is eager to motivate them back and inspire for even more action. We will contact you through email if additional details will be needed. After you receive coupons, you’re free to do whatever you want with them. If you want to use them for personal needs – do so. If you want to give part of the coupons or all of them to someone else – you’re free to do so as well. Our main goal is to inspire community for action and foster its growth. So if you know MVPs who would benefit from this incentive (or who can share some love with you ;), please let them know through Twitter, email or personal message by directing them to this blog post. AdDuplex might ask for additional proof of identity.